Design. Shedding light over copy. Historically, we have been taught that form without essence is nothing, that beauty is mere shallowness and cannot exist on its own—for it needs substance. How is the relationship the other way around? Can content stand up for itself without a proper layout to make it desirable? In August 2010, Bryan Gardiner writes and article for Gizmodo. The subject is hot and well researched, it receives a provoking title, and gets featured on a top trafficked website. The Secret Histories of Those @#$%ing Computer Symbols, however, goes unnoticed. No comments left from readers and not that many likes. Last month, designer Sofya Yampolsky in partnership with Warm Gun and 500 Startups, take the exact content to the next level. 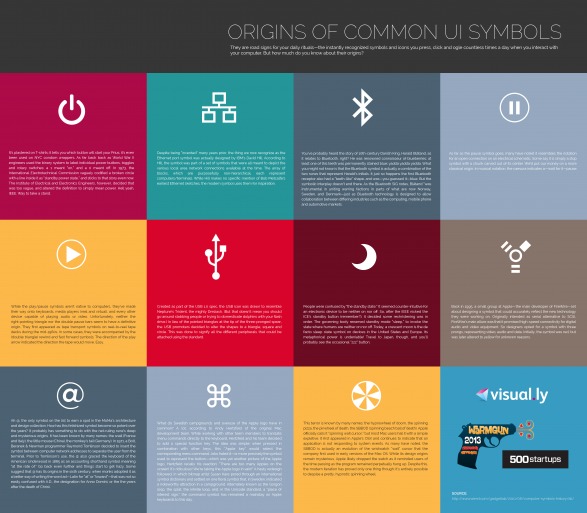 By putting together the elements into colored frames and redrawing the UI symbols, they manage to convert a long ago forgotten post into a worth sharing infographic. The same content gained readability. The information was interesting enough before, but it never reached so many people. Of course, Visual.ly and 500 Startups backed this project and helped it spread (instead, Gizmodo has a 559 Alexa rank). The image was picked by blogs, and with all the tweets, pins and likes received, it became a true viral for the design community. Internet has emphasized the role of design and, without it, plain content risks going unnoticed. Design brings out the best of plain information. Back to the initial question, my take is that any online manifestation needs a proper visual dimension. And that, in time, we humans won’t separate design and content, but we will learn to think them as one. Another infographic from designer Sofya Yampolsky on the chances of you being here, reading this.